Happy Wednesday everyone! Recently, I was sent the Light Therapy Acne Spot Treatment from Neutrogena to try out and review for you guys. A couple months ago, I reviewed the Light Therapy Acne Mask, which you can check out here if you would like to learn more about the actual treatment and my thoughts. Now, Neutrogena has come out with a smaller, portable version of light therapy for on-the-go pimple treatments. For a general overview, light therapy uses red and blue light to treat pimples. Each colour works differently to combat two of the major factors that contribute to acne: bacteria and inflammation. The red light targets inflammation while the blue light fights bacteria. 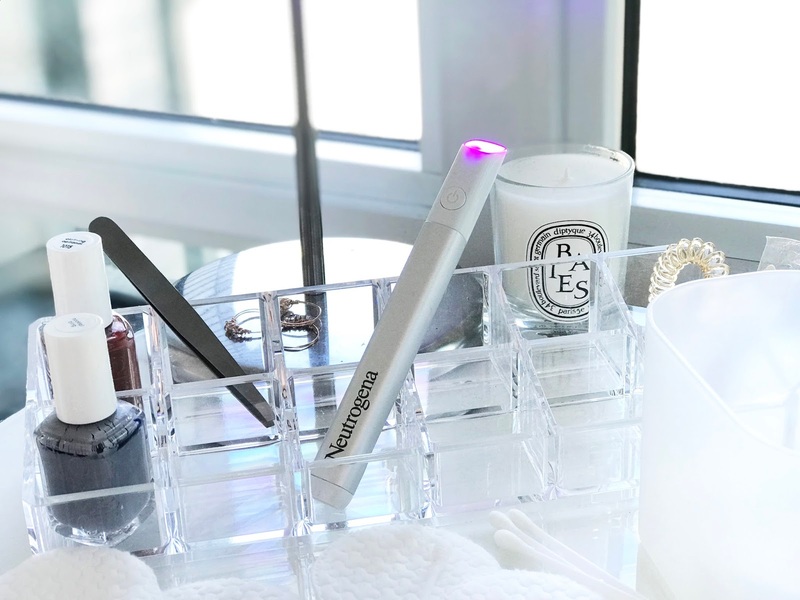 The Light Therapy Acne Spot Treatment is super slim and reminds me of a pen. The treatment is powered by a single AA battery and has a 1/2" area to enclose the breakout or pimple when you hold it up to your face. To use it, you simply apply it directly on clean skin so that the light fully surrounds the pimple. Each treatment lasts for 2 minutes and the device will turn off automatically after the 2 minutes. It should be used three times a day until the pimple is gone. In terms of my own skin, I generally have pretty clear skin however, for the past two months, I have been battling the worse breakouts, especially around my nose and chin. This is probably due to several factors including stress and diet, but that also means I was able to put the Light Therapy Acne Spot Treatment to the ultimate test! I had two major breakouts to test this treatment on: one on my nose and one on my chin. Both were at the point where they were pretty prominent and very painful, but I was curious to see if the spot treatment would speed up the healing process. I used the treatment on both breakouts for two days, and by the third day, I noticed less swelling on both, and by the fourth day, the breakout on my nose had popped, and was on it's way to healing. The breakout on my chin was considerably smaller, but what I noticed the most was that while there was still a "bump", there was absolutely no redness on or around the pimple. I think by having the light treatment hit directly on the breakout, it's much more effective than having it rest 1-2" above the face. Ultimately, there are two things I love about the spot treatment. Firstly, I like how it is a direct treatment to the breakout. It reminds me of cream or gel based spot treatments, but light therapy is less invasive and doesn't lead to any drying or flaking. Secondly, I love how slim the spot treatment is, and I can literally carry it around with me in my purse or have it at my desk. I can also see myself bringing it with me to travel, and since it only uses a single battery, it's super easy to replace. You can pick up the Neutrogena Light Therapy Acne Spot Treatment from Shoppers Drug Mart in Canada. It retails for $32.00 CAD and while there is an expirary date on the pen (as the LED lights do become ineffective at some point), the only other cost is a battery replacement when it runs out. 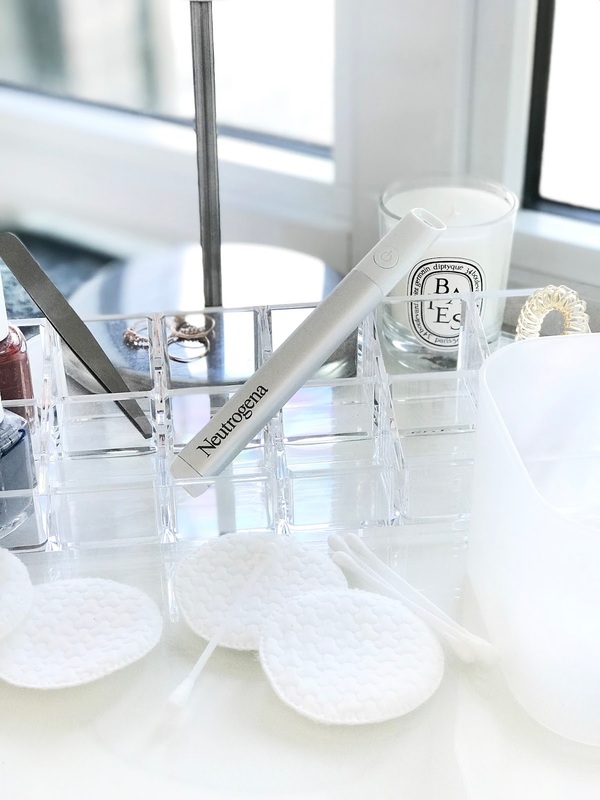 Have you tried any of the Light Therapy treatments from Neutrogena? What do you think of them? Let me know in the comments down below! *Disclaimer: Product sent for free for review. All opinions are honest and my own.